(Nanowerk News) Telescope lenses someday might come in aerosol cans. Scientists at Rochester Institute of Technology and the NASA Jet Propulsion Laboratory are exploring a new type of space telescope with an aperture made of swarms of particles released from a canister and controlled by a laser. These floating lenses would be larger, cheaper and lighter than apertures on conventional space-based imaging systems like NASA's Hubble and James Webb space telescopes, said Grover Swartzlander, associate professor at RIT's Chester F. Carlson Center for Imaging Science and Fellow of the Optical Society of America. 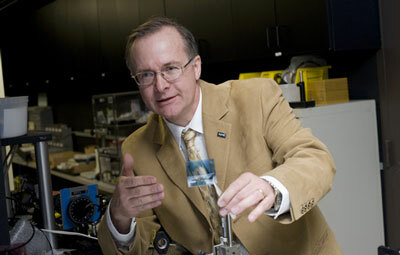 Swartzlander is a co-investigator on the Jet Propulsion team led by Marco Quadrelli. NASA's Innovative Advanced Concepts Program is funding the second phase of the "orbiting rainbows" project that attempts to combine space optics and smartdust, or autonomous robotic system technology. The smart dust is made of a photo-polymer, or a light-sensitive plastic, covered with a metallic coating. "Our motivation is to make a very large aperture telescope in space and that's typically very expensive and difficult to do," Swartzlander said. "You don't have to have one continuous mass telescope in order to do astronomy--it can be distributed over a wide distance. Our proposed concept could be a very cheap, easy way to achieve large coverage, something you couldn't do with the James Webb-type of approach." An adaptive optical imaging sensor comprised of tiny floating mirrors could support large-scale NASA missions and lead to new technology in astrophysical imaging and remote sensing. Swarms of smart dust forming single or multiple lenses could grow to reach tens of meters to thousands of kilometers in diameter. According to Swartzlander, the unprecedented resolution and detail might be great enough to spot clouds on exoplanets, or planets beyond our solar system. "This is really next generation," Swartzlander said. "It's 20, 30 years out. We're at the very first step." Previous scientists have envisioned orbiting apertures but not the control mechanism. This new concept relies upon Swartzlander's expertise in the use of light, or photons, to manipulate micro- or nanoparticles like smart dust. He developed and patented the techniques known as "optical lift," in which light from a laser produces radiation pressure that controls the position and orientation of small objects. In this application, radiation pressure positions the smart dust in a coherent pattern oriented toward an astronomical object. The reflective particles form a lens and channel light to a sensor, or a large array of detectors, on a satellite. Controlling the smart dust to reflect enough light to the sensor to make it work will be a technological hurdle, Swartzlander said. Two RIT graduate students on Swartzlander's team are working on different aspects of the project. Alexandra Artusio-Glimpse, a doctoral student in imaging science, is designing experiments in low-gravity environments to explore techniques for controlling swarms of particle and to determine the merits of using a single or multiple beams of light. Swartzlander expects the telescope will produce speckled and grainy images. Xiaopeng Peng, a doctoral student in imaging science, is developing software algorithms for extracting information from the blurred image the sensor captures. The laser that will shape the smart dust into a lens also will measure the optical distortion caused by the imaging system. Peng will use this information to develop advanced image processing techniques to reverse the distortion and recover detailed images. "Our goal at this point is to marry advanced computational photography with radiation-pressure control techniques to achieve a rough image," Swartzlander said. "Then we can establish a roadmap for improving both the algorithms and the control system to achieve 'out of this world' images."